Good morning! 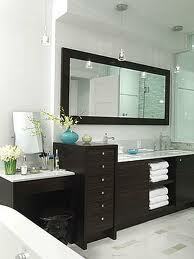 I have been on the hunt for a way to save some mulah$$ on bathrooms which can be very pricey little buggers. My thoughts took me to Ikea with an open mind, and boy did I hit the jack pot! 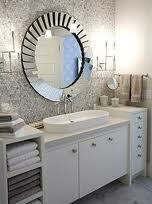 Here are some of the inspirations from Sarah Richardson's bathrooms (who I love), as well as the main contenders. 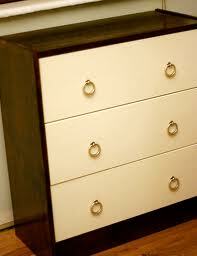 NYVOLL: $299 May not be large enough, however I could modify a MALM for this style and do a series of 3. Oh these are stunning! 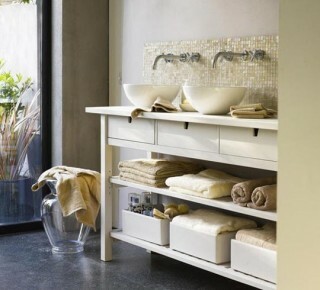 Each photo has got my attention and I can't wait to see what you do in your own bathroom! I didn't know a back splash could make a girl drool, but then again, I've never lathered my hands opposite mother-of-pearl. Could you imagine? How divine! I'm not sure if you have that exact choice in mind, however, it's apparent that you've got your eye on creating a feel of luxury. Personally, I am a longtime fan of darker woods and light walls. I will admit though, your inspiration boards could sway me. 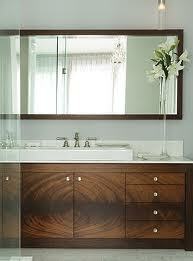 The lighter wood was so appealing surrounded by bright whites and crystal accents. Absolutly beautiful! 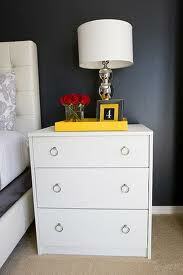 With your fabulous style, no low budget stands a chance at holding you back.